The man who coined the phrase “Holy Cow!” and was the voice of the Minnesota Twins lived in the same house in St. Louis Park for 55 years. He bought the house at 3149 Ramona (later 3231 Alabama) in 1922 for $10,000 and lived there until he died on December 30, 1977. Halsey Hall was born on May 23, 1898. He remembered having to be “spanked” to go to his first baseball game in 1902. Talking, though, came naturally, a love he attributed to his mother, who had been a prominent New York actress. After serving in the Navy during World War I, he began a career as a writer in 1919. 1934 was his first year broadcasting for the Minneapolis Millers baseball team on WCCO radio. That year he also covered U of M football games, and both the Millers and the Gophers won championships that year. 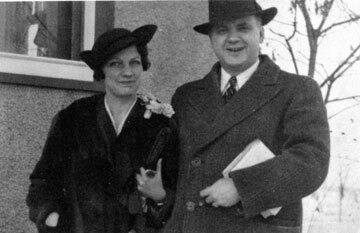 Halsey married wife Sula in 1922. For a memoir by his daughter, Sue Hall Kennedy, see Something in the Water. For more information about the life of Halsey Hall, see http://www.pavekmuseum.org/Halsey_Hall.htm .